This branch is about ten inches in diameter and about twenty-five feet off the ground. 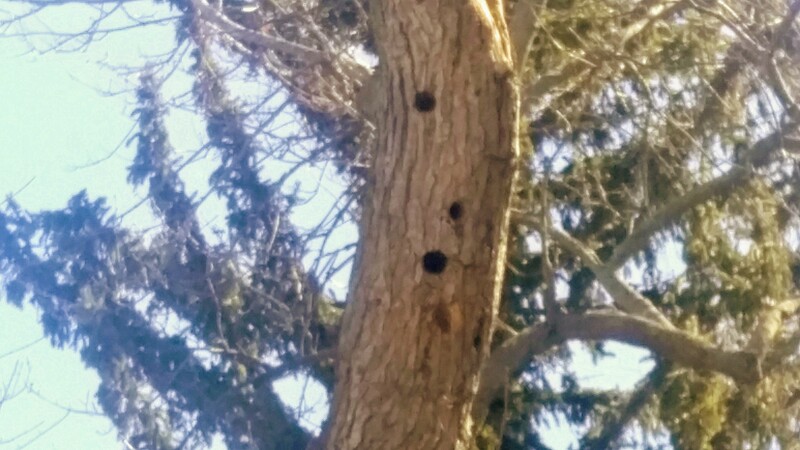 The holes were most likely made by hairy woodpeckers, downy woodpeckers prefer smaller diameter branches. When there is a lack of trees,woodpeckers will look for other places to build their nests. The outside wall of a house can be tempting for them, especially if it is covered with wood siding. They can be fairly destructive if they drill into a wall to make their nest. More dead trees left standing may draw woodpeckers away from homes and back to their preferred habitat. It’s not only woodpeckers that benefit from standing dead trees, other species of songbirds and small mammals will move into old woodpecker nests once the woodpeckers have eventually moved on. If you decide to leave a damaged tree standing, just make sure it is in a location where it won’t cause any damage if the branches, or even the whole tree, falls.